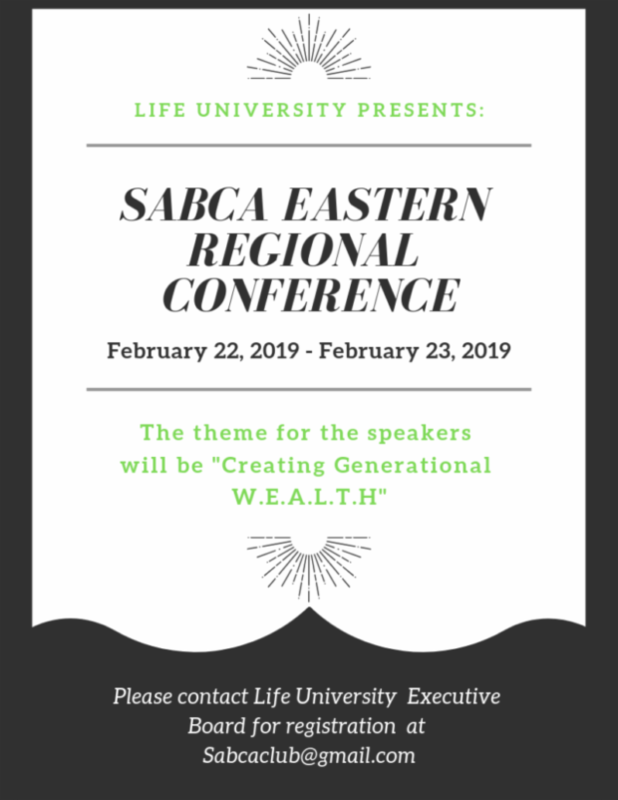 The 2019 Eastern Regional conference will be held under the leadership of Dr. Kevin Kersee (Eastern Region DC Representative), Future Dr. Chris Vinson (Eastern Region Student Representative, and Future Dr. Chohnice Daniels (National Student Rep) at Life University! This is a great opportunity for both doctors and students to network! Reconnect with those you met at the National Convention and meet more NEW people! Life University to host the Student American Black Chiropractic Association’s Eastern Region Conference. The conference will consist of several Doctors speaking on “Creating Generational W.E.A.L.T.H.” WEALTH stands for Wellness, Education, Achievement, Legacy, Technique and Holistic. Following the speakers will be the ABCA Eastern Regional Meeting. Closing out the conference will be Life University SABCA chapters Annual Black History Gala. (Tickets sold separately). Hotel accommodations are available at the Doubletree by Hilton. Book on-line now here. If you have any questions about the Eastern Regional Conference please send an email to sabcaclub@gmail.com.